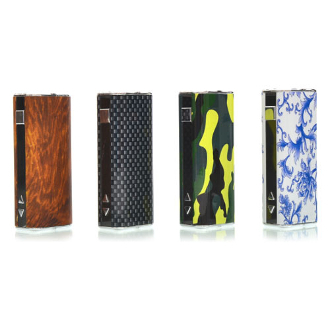 Cute and compact are the perfect adjectives to describe the ECU 23 Vaporizer e cig Box Mod. Its small stature makes it a breeze to carry, while its high wattage output gives you a strong and voluminous vape experience. Choose from one of the many designs it's available in to make your ECU 23 vaporizer e cig display your inner vape diva! Feeling classy and sophisticated? Try our "Wood Grain" design! A beautiful masterpiece of a wooden brown back ground with black marble swirls running through it. Or put your game face on! And pick up our "Green Camo" design. But don't worry, depending on your house decorations, it probably won't blend in and become un-seeable. No matter your style, the ECU 23 vaporizer e cig is adaptable in both design and wattage, making it a perfect match just for you. Turn on/off: The ECU23 box MOD can be turned on by 5 consecutive clicks. OLED screen: OLED screen displays battery life, resistance, wattage and voltage. Switch the VV/VW mode: Press the square button 3 times to switch the VV/VW mode when the battery is turned on. 23w output wattage: Can go up to 23 watts, which caters to your vaping needs. It will hold its high wattage output even when the power gets low. Recharge: ECU23 is charged through a 5 pin USB port at the bottom. You can vape while it is being charged. ECU23 supports charging with 1A wall adaptor which is fastest. Multiple protection functions: Such as atomizer short-circuit protection, over 10s protection, low-voltage protection. eGo/510 connector: Helps you to connect ECU23 to eGo thread atomizers if necessary.